10 Awesome Last Minute Gifts Under $10 — How Do You C.U. I spent the better part of December trying to find a sturdy easel for my 3-year-old niece Allie. After hours of unsuccessful digging for online coupon codes, I almost settled on a $75 multi-purpose easel. A day later, I went to IKEA and while wandering around I spotted this gem for $9.99. It’s surprisingly sturdy and assembling wasn’t awful. When it’s the dead of winter and your family is stuck indoors, answer the inevitable “I’m booorrrred” with Perler beads. It will keep everyone (including parents) entertained for hours AND it’s great for hand eye coordination. Pro tip: The internet has thousands of free templates and the finished products make great little gifts. Who wouldn’t want a pixelated Mario magnet? If you’re going to buy a coffee mug, the bigger the better. A standard sized coffee mug holds a measly 8-10 ounces, while these behemoths accommodate a massive 16 ounces. They are big, modern and adorable. If you have a friend or family member with an Apple iPhone or iPad, you can now give them an app as a gift. My recommendation is “Monument Valley,” a beautiful but tricky little puzzle game. In the App Store, locate the application you want to give, click the dropdown menu next to "Buy App" and select "Gift This App." I have never once been disappointed with a scratch-off ticket. I have however, been disappointed with other gifts that were clearly purchased from a gas station. Skip the faux flowers and candy bars and give the gift of surprise instead. Starbucks has a whole host of cutesy gifts under $10 in store. My pick is this Teavana Joy 2015 blend. This is the perfect tea for powering through those cold winter days. 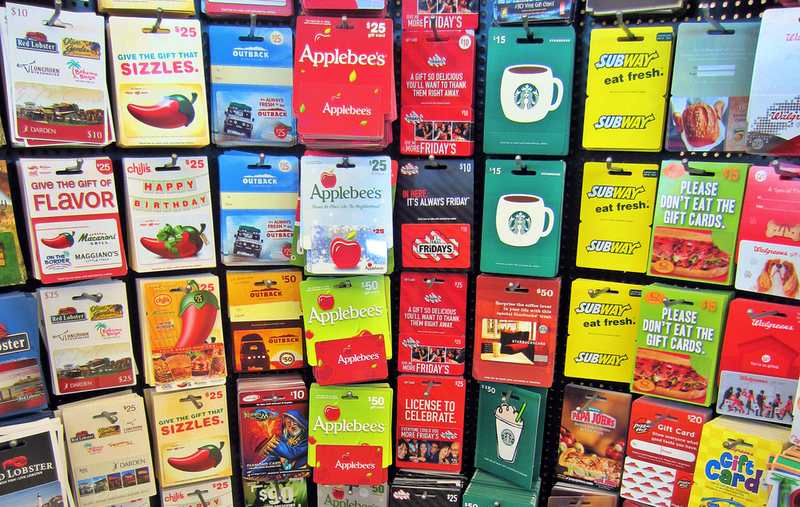 Gift cards are not a cop-out. A practical gift for almost anyone (as long as you choose the right one) they are the perfect substitute for giving plain old cash. Stick to gas cards—any adult with a car will be grateful. It’s hard to find cosmetics that are natural and don’t cost a fortune. It’s safe to say I’m obsessed with eos’ spherical lip balms—I own almost every flavor. It’s inexpensive, lasts for months and lacks the harsh chemicals of other lip balms. The website boasts “eos lip balm is 95% organic, 100% natural, and paraben and petrolatum free.” Sold. This gigantic insulated jug has served my family well for years. It can be used for both warm and cold beverages. More than any other water bottle, this actually keeps liquids temperate for hours. Fill it with peppermints and it’s the perfect last minute gift for almost anyone. Got a word nerd in your life? Surprise them with this cute little magnetic poetry set. What are your favorite last minute gift ideas? Share them with us in the comments!